In Paris Albéniz could concentrate on composition, thanks to the financial support he received from his millionaire patron Francis Money-Coutts, whom he had met in London and whose oft-despised librettos would provide the basis for some of his songs as well as several of his most renowned operas, namely, Henry Clifford (Gran Teatre del Liceu, Barcelona, 1895), Pepita Jiménez (Gran Teatre del Liceu, Barcelona, 1896), and Merlin (c.1898). In 1896, at the age of 36, and despite his already sizable oeuvre, Albéniz enrolled as a student in Vincent d’Indy’s counterpoint class at the Schola Cantorum, the institution where he would later teach piano (1898-1900). His admission to the Schola marked a turn towards a style scholars and critics have often regarded as more sophisticated and intellectual than that of his previous works. It was in Paris, too, that Albéniz composed Catalonia. The work was originally intended as the first of a three-movement “suite populaire” bearing the same title, but probably due to the fact that during his Paris years he received more commissions than his delicate health could afford, he ended up turning down this more complex project. The one-movement work, as we know it, was dedicated to the Catalan painter Ramón Casas. It received its first performance at the Société Nationale de Musique on 28 May 1899, and was published by Durand that same year. 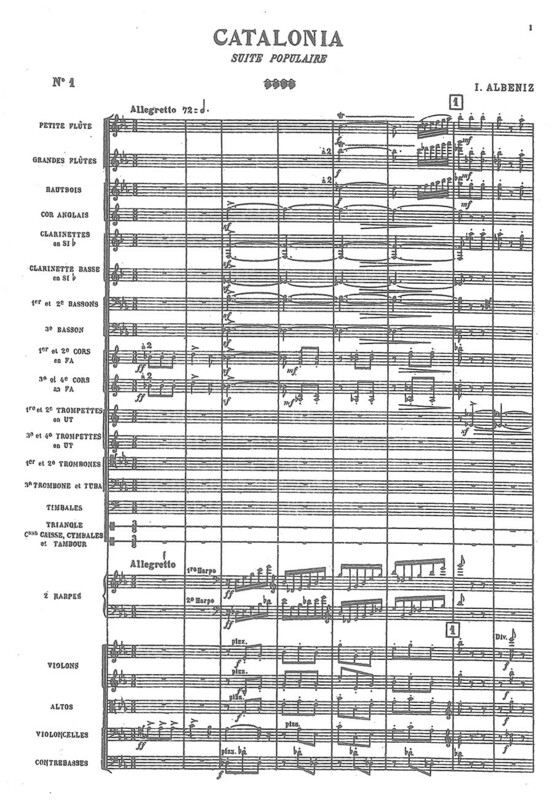 Paul Dukas was Albéniz’s tutor in orchestration by then and surely assisted him in this particular score. With brilliant aplomb, Catalonia basically follows a free sonata form starting in E flat major but recapitulating in E major at rehearsal number 47. The basic material is drawn from two Catalan songs, the first of which, El pobre terrisaire, appears right at the beginning, serving as the main tonal and thematic area. 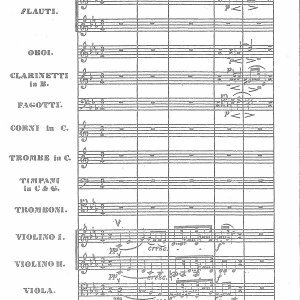 The first complete statement of the second theme, La Filadora, is played by the oboe at rehearsal number 21, on the dominant B-flat major. There is, in addition, a contrasting duple-meter concluding section played presto, starting at rehearsal number 58. Albéniz’s Catalonia may be seen to embody some of the many cultural dilemmas that beset the Hispanic music by both Spanish and French composers living in Paris at the time. Some of the French ones, like Chabrier, Debussy, Ravel – and we might add somewhat later and lesser-known figures with extensive Hispanicist catalogues, like Henri Collet and Raoul Laparra – were hardly concerned about the accuracy of their presentation, despite their propagandistic advocacy of authenticity. Some of them hardly or never traveled to Spain. As a result, their portrayals reveal more about what we may methodologically call the “representing” culture – France – than the culture represented. Besides, one might wonder to what extent it is possible for music to accurately represent any given culture, given the semantic ambiguity with which it generally exploits the communicative faculty, and considering that listeners and their cultural backgrounds play an important rôle in the construction of musical meaning. These concerns might seem secondary in the case of Albéniz, as his origins were Spanish. But they are worth considering in light of what happened to the music of other non-French composers surrounding the Schola Cantorum, whose works were also performed at the Société Nationale. The latter’s belligerent nationalistic motto, “ars gallica” conveys an idea of how these “foreign” works somehow came to be integrated in an essentially French cultural program. The otherness they stood for as non-French exotically-colored works – together with some music by French composers drawing on provincial and foreign exoticisms and themes – played a seminal rôle in the construction of the identity of the French “self,” just as historians of post-colonialism have demonstrated for other Western nationalisms at least up to World War II.